We Can Help You Print Like Lik! FujiFlex is a silver-halide digital photographic paper that has a polyester-based coating that makes it super glossy and slick. Not just any machine can run FujiFlex paper. Like the good old days, FujiFlex is true continuous tone photographic paper, and has to be run through photo chemistry to reveal the image. With this process, the image is burned into the emulsion layer of the paper itself. Not one drop of ink is laid over the substrate to produce the image. What really makes FujiFlex spectacular is pairing it with acrylic. We do what’s called a second-surface mount (also called face mounting), where the acrylic is applied directly on top of the print. So, you look through the acrylic to see the print. FujiFlex is known for its ability to hold detail in shadows and highlights. 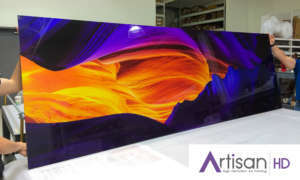 When mounted to the Plexiglass, you have an image with amazing depth and three dimensionality. To get a print of this caliber, upload a file to our Customizer and choose FujiFlex for your print type. Select standard 1/8″ acrylic, or choose 1/4″ plexiglass (acrylic) for a nice deep edge profile. If ambient light or reflections from windows or spotlights are a concern, please select gallery quality 1/8” TruLife acrylic. For the full ordering process, visit this blog post. See just how great your image will look when you print Like Lik! Upload Your Photo or Digital Art to Get Started!